Senopati Therapy Center is a new healthcare facility serving the wellness needs of our community. 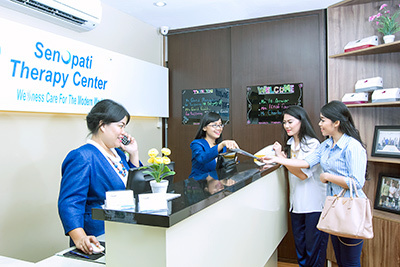 Our clinic is legally operated and supported by the Indonesian government and offers the latest in chiropractic care, massage therapy and physiotherapy to help you heal fast and feel your best. Chiropractic care can help you increase your activity level, allowing you to be healthy, happy and full of energy. Visiting your chiropractor is one of the best decisions you can make for yourself. Our team is here to support you, giving you the ability to live a higher-quality life. The many conditions we help include back pain, neck pain, shoulder pain, knee pain and headaches. Visit our brand new West Jakarta chiropractors today! Conveniently located in the PX Pavillion, same-day appointments, weekend appointments and late appointment hours are available. You can also stop by our walk-in clinic at your convenience. Insurance is accepted. Call +6221 5835 8609 or book an appointment online now!